Steema is pleased to announce the release of the new TeeChart for Xamarin.Forms Charting Library. TeeChart for Xamarin.Forms is written with 100% C# code and offers cross-platform support for .NET desktops, Windows Phone, iOS and Android. TeeChart for Xamarin.Forms was built to support Xamarin.Forms platform. Includes 60 Chart styles, Gauges and Maps all from within the same charting library, with no need to obtain separate product modules. TeeChart is fully interactive, supports custom-drawn client elements on the canvas and offers 2D and 3D charting options for a range of applications types, from high-speed realtime & financial, scientific & business, to presentation graphics. The new release includes the binary installer; the entire source code will be available as an option for purchase and is expected to be offered in a nearest future. The evaluation is fully functional and may be accessed via the download page. For more information visit TeeChart for Xamarin.Forms page . 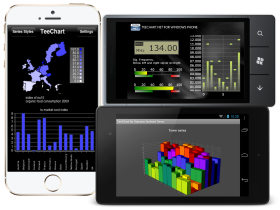 To celebrate the launch of TeeChart for Xamarin.Forms we are offering a special 20% discount until 16 January 2015. To take advantage of this limited time offer follow this link to the Order page. TeeChart NET for Xamarin.Forms License comes with a renewable one-year subscription service that entitles customers to free updates and technical support.